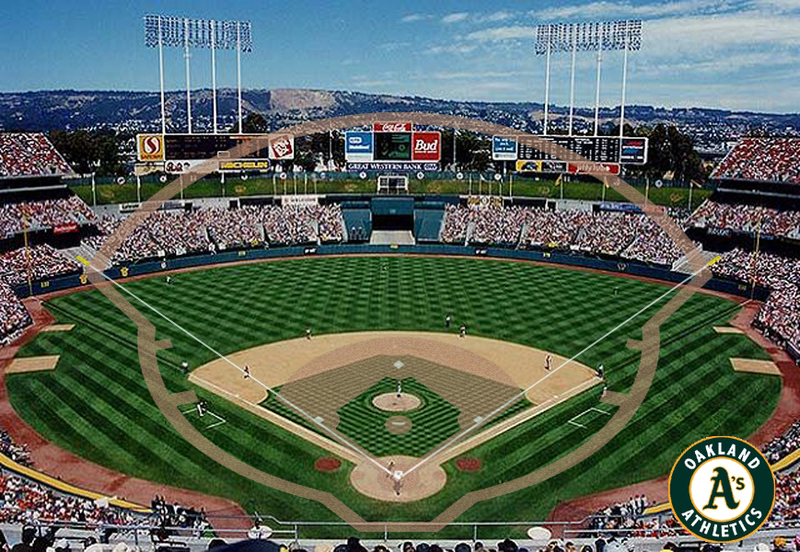 Unusual dimensions of the Oakland-Alameda County Coliseum make baseball more like a cricket experience. I (Evander) have gone on the record regarding the Cleveland Indians. The Oakland Athletics are my second “surprise pick” for 2011. Why? The Athletics play in the most unusual stadium in Major League Baseball. It has tremendous foul territory (almost resembling a cricket field), which is a big advantage to pitching. Why? Foul balls that often wind up in the seats are caught for outs at first, third, and home in Oakland. More importantly, they have sturdy young pitching: Dallas Braden hurled an ultra-unusual perfect game (no runner reaches base) in 2010. He’s 27. Three others of the starting rotation are 25 or younger: Brett Anderson, Trevor Cahill, Gio Gonzalez. (Of the starting rotation, I believe three are left-handed to provide excellent balance.) The pen is decent. Hideki Matsui, 2009 World Series hero for the Bronx Yankees, is the DH, and will provide veteran leadership. The ubiquitous Coco Crisp will do his thing. It’s a long, exhausting trip to Oakland for most of the A.L. The teams closer by, the Seattle Mariners and the Los Angeles Angels (of Anaheim), are offensively challenged. The A.L. West is wide open. The Texas Rangers, even without future Hall of Famer Vladimir Guerrero, will score a lot of runs but, as almost always, give up a lot (particularly with Cliff Lee moving to Philadelphia), even under the watchful eye of the great Nolan Ryan. As few as 83 wins should be enough to take the division, and I think Oakland, which improved to 81-81 last year, is in a position to make the postseason for the first time since 2006. General Manager Billy Beane, of Moneyball, I hasten to add, is one of the most innovative executives in Major League Baseball, the perfect person for today’s belt-tightening, Great Recession world. This entry was posted in Baseball, Right Off the Bat Website, Yankees and tagged Billy Beane, Brett Anderson, Cleveland Indians, Cliff Lee, Coco Crisp, Dallas Braden, Gio Gonzalez, Hideki Matsui, Los Angeles Angels of Anaheim, Moneyball, National Baseball Hall of Fame, New York Yankees, Nolan Ryan, Oakland Athletics, Philadelphia Phillies, Trevor Cahill, Vladimir Guerrero. Bookmark the permalink.